While the competitive rates initially drew business owners Eric and Deb Lockhart to Dupaco Community Credit Union, they were only part of the reason the couple has remained with the financial cooperative for nearly two decades. 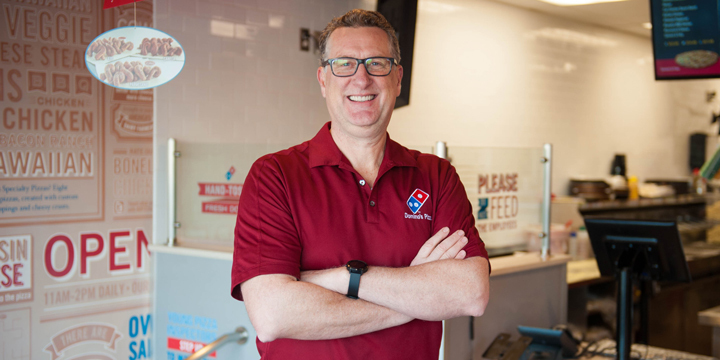 Since joining forces with Dupaco, the Domino’s franchise owners have been able to grow their pizza business and expand into new markets. They’ve gone from four to six locations, with restaurants in Dubuque and Cedar Falls; Platteville, Wis.; and Rock Island and Moline, Ill.
Dupaco loans also have helped the Lockharts remodel all their locations. “It allowed us a newer, crisper look, which you need in any business, but especially the restaurant business,” said Eric, of Dubuque. The loans are more than money, though. Eric considers Dupaco a partner in his business. “They’re a consultation partner. They give me sound financial advice on which direction they think I should take my business,” he said. In the past, Eric turned to banks for his business needs. But over the years, he discovered credit unions have his best interest in mind. “Credit unions are owned by their members, and they’re not all about the almighty buck for the shareholders. In the end, credit unions are looking out for their members,” he said.